The flesh of onions is soft and includes much water. Also, the spicy part of the onion that agitates the eyes helps our blood flow well, and thus is useful for prevent lifestyle diseases. 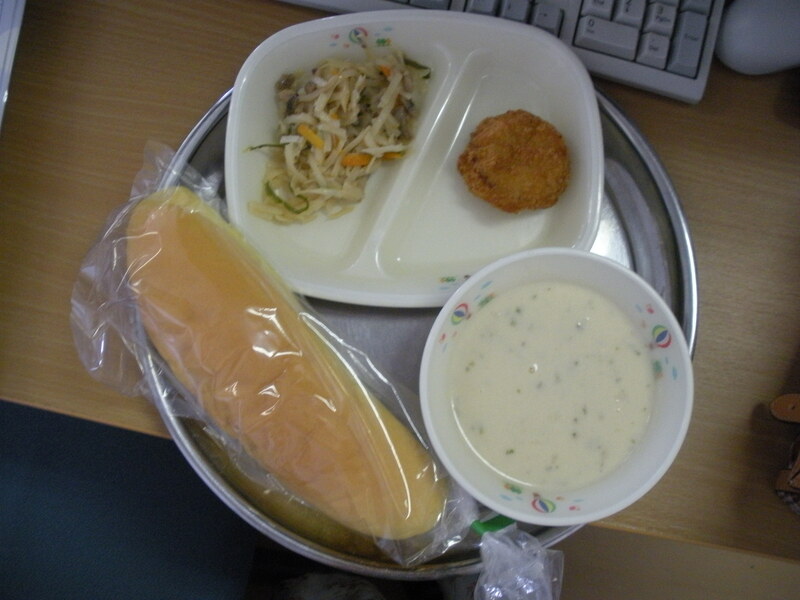 I didn’t eat school lunch today, so above is a picture of the bento I brought to work. 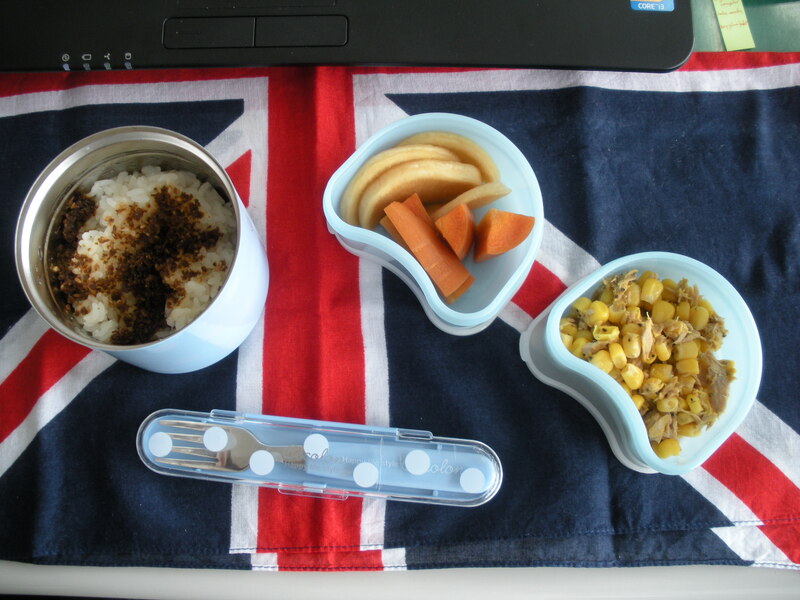 It consists of local “Star Dream” (星の夢) rice topped with furikake my friend gave me, with a side dish of some tuna mixed with corn and miso pickles I made from carrot and daikon. Lately I’ve been really in love with me miso pickles, being they are cheap, easy to make, and delicious. For dessert, I had half a diamond rice cake, not pictured. It’s a tradition to eat diamond rice cakes during the Festival of the Peaches, which was last Sunday. This means that when I went shopping on Monday, the leftover rice cakes were half off! so I bought one. When I was growing up, we didn’t go to the store that often. My mother is a fan of costco, which meant we bought in bulk and used it for awhile. Similarly my grandfather lived rather rural so in a similar manner, he would drive into town, buy necessities for a month or two and then drive back. I have a theory that this American habit stems from pioneer days when the closest store was a day or two wagon ride away. But in Japan, it is common to go to the store often, a housewife might go everyday or even more than once a day. The sale system in Japanese stores encourages this: Often they have timed sales, where an item is on sale but only for a couple hours. So you must go then to get those items. Also, there is a stronger culture of walking/ public transportation in Japan, so your strength limits how much you can buy in a single trip, although I have seen some grandmothers riding tricycles or pulling sleds filled with groceries before. And finally, I think a buying-in-bulk culture was prevented from developing by merchants directly visiting the house, which even common today. 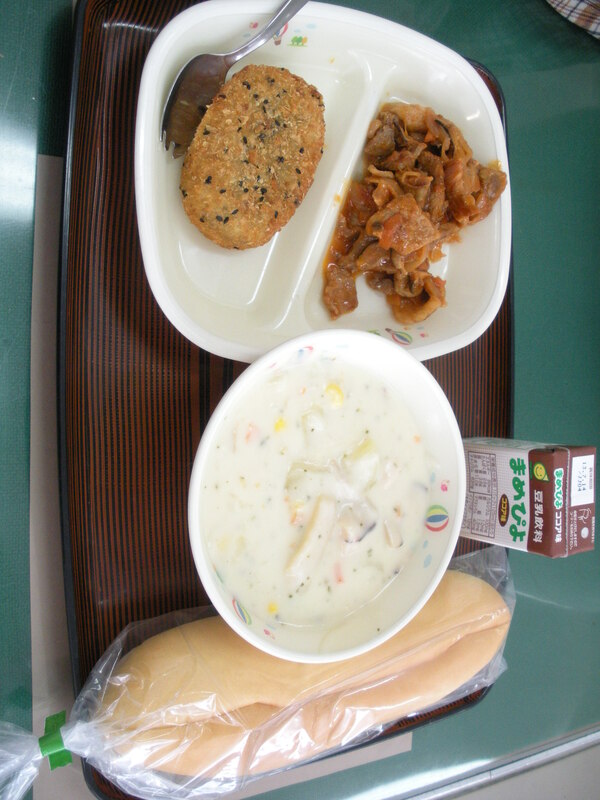 Carrots are the vegetable that appear the most in school lunch. They have lots of karotein, which we need for preventing colds. Eat lots and pass the time happily. 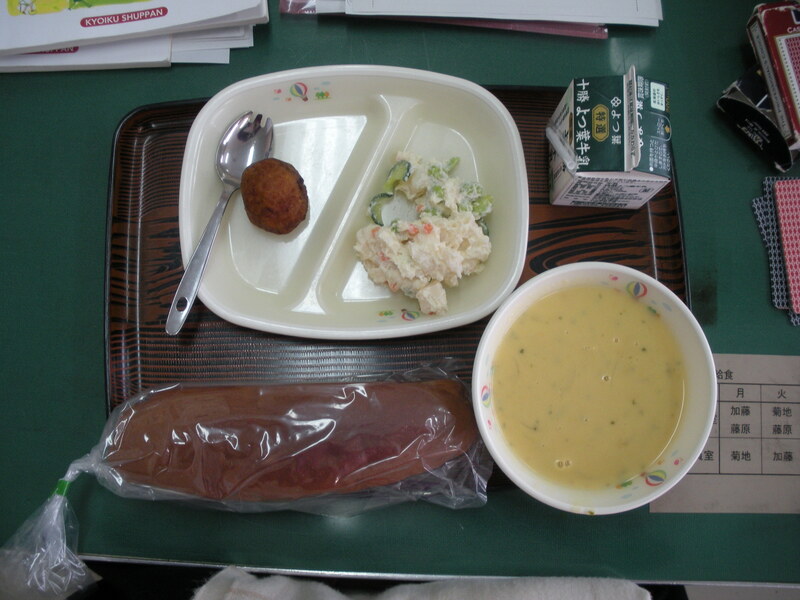 The goal of school lunch was, like in Japan, to give children at least one hot filling meal a day. 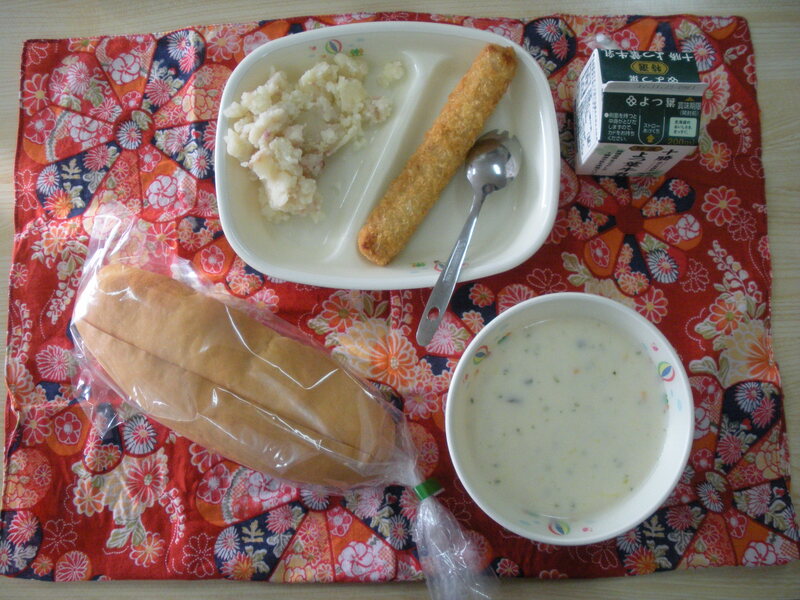 Even today, the price of school lunch is kept down as much as possible. For students who cannot afford even that price, there is reduced and free school lunch program. The present author was on the reduced lunch menu, so I paid less than 50 cents everyday for school lunch. Pretty inexpensive, I think. Bifun noodles are made from rice flour. The unsticky, long-grained Indica rice is used to give it its characteristic texture. Today’s stew uses Autumn ingredients. Everyone, when you hear of Autumn ingredients, what do you think of? Modern times are when foods are plentiful and we can get any food regardless of the season. This extravagance is also saddening. This time of year, the market I always go is selling many delicious and very inexpensive vegetables grown in my town. Indeed, I sometimes feel overwhelmed by all the wonderful of this. When I notice all this abundance of the Autumn, I also think of the amazing extravagance that characterizes modern times. Even in the middle of winter, I can eat papaya and pineapples. Even in the middle of summer, I can indulge in as much shave ice as I want. This makes life so easy to live, but it has become easy to lose the seasonal awareness and gratitude that plays an important part in making us correct persons. So as our school lunch menu reminds us: Food is plentiful, but the extravagance is also saddening. So let’s make an effort of eat seasonal and local foods! That said, today’s Autumn stew was really tasty!! Yum! Yum! Black Pepper, or rather the lack of it…. Carbonara is a type of pasta sauce which means “pasta cooked with charcoal”. 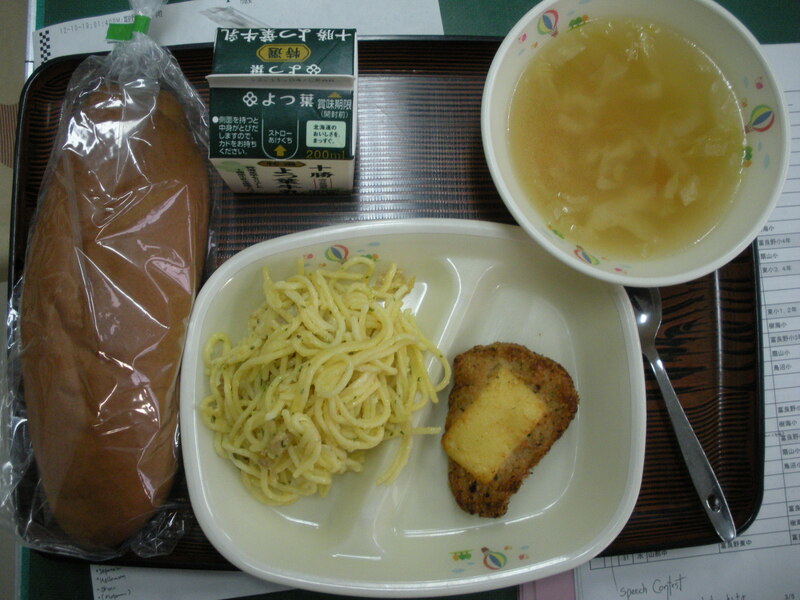 It’s said that it is mixed with black pepper in Italy. Meat fillet is a low fat, smooth and fleshy meat. It is a light tasting meat with very few vices. Because each animal only has little bit of fillet meat, it is expensive. While I think I personally prefer a milder bread, it seems today’s sweet brown sugar bread was more popular than usual with my students. One of my first years today kindly informed me “This is パン. Good!”, so I know that she liked it. 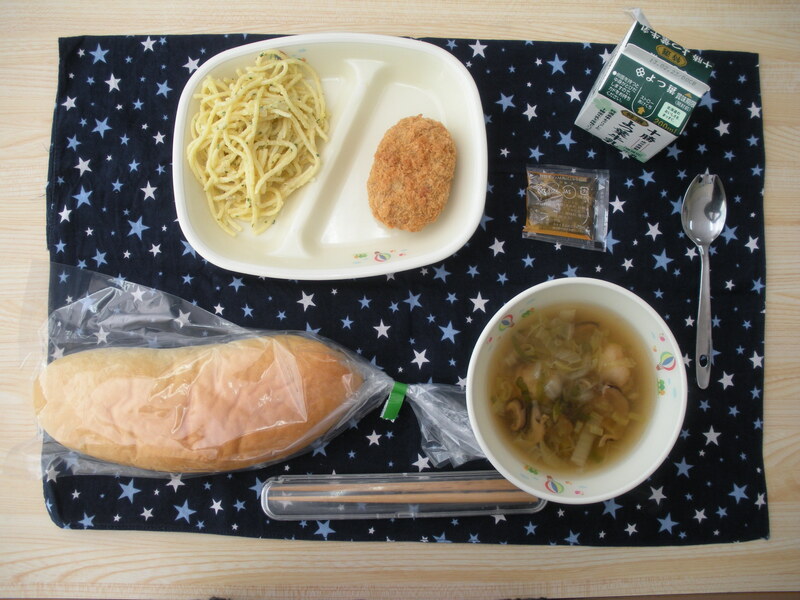 As for the pork fillet, I am afraid I simply do not like meat, although I did my best and ate it anyways. However, it reminded me of a conversation I had with my friends last night in which they stated pork was very common in Hokkaido but beef was often eaten in Honshu. My friends–all from the Northern Country–were of the opinion that pork was certainly delicious enough, one hardly even needed beef. This in mind, I asked my students which they preferred: pork or beef. Four said pork, and only one boy said beef. I suppose that is the answer I should have expected. Today’s bread was made with 黒糖, or “black sugar” (ie: brown sugar). I don’t know what kind because it didn’t say on the lunch menu. But the most famous place in Japan for brown sugar is Okinawa. This is unsurprising, given the history of sugar in Japan. If I remember correctly, for a long while Japan did not have the technology to process sugar, but when they finally borrowed it the only place that could really grow sugarcane was Okinawa and Kagoshima. In modern times, a lot of sugar comes from sugar beets, but it doesn’t taste as good. Seriously, it doesn’t. It has this yucky sticky feel that Okinawan/Hawaiian sugarcane sugar lacks. So I recommend Okinawan or (of course) Hawaiian sugar. 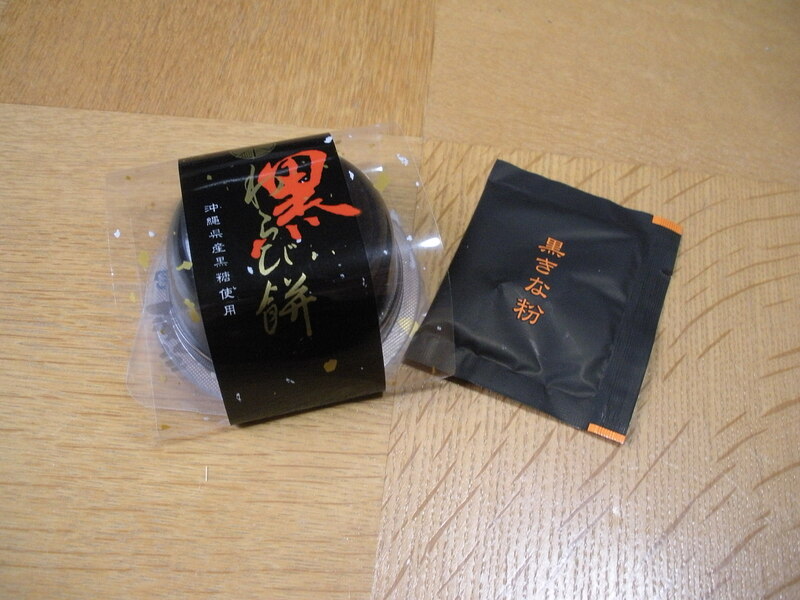 Finally, here is picture of the delicious Okinawan Brown Sugar Warabi Mochi that my tea teacher gave me last week. Yum! Yum! “Nakaochi (scraps)” of today’s Salmon Scraps and Vegetable Breaded Patty means the meat left nearby and on the bone when filleting the fish. So its patty made of a blend of that meat. Kabocha bread and potato soup are a delightful combination. As I’ve mentioned before, I eat mine by dipping the bread into the soup. 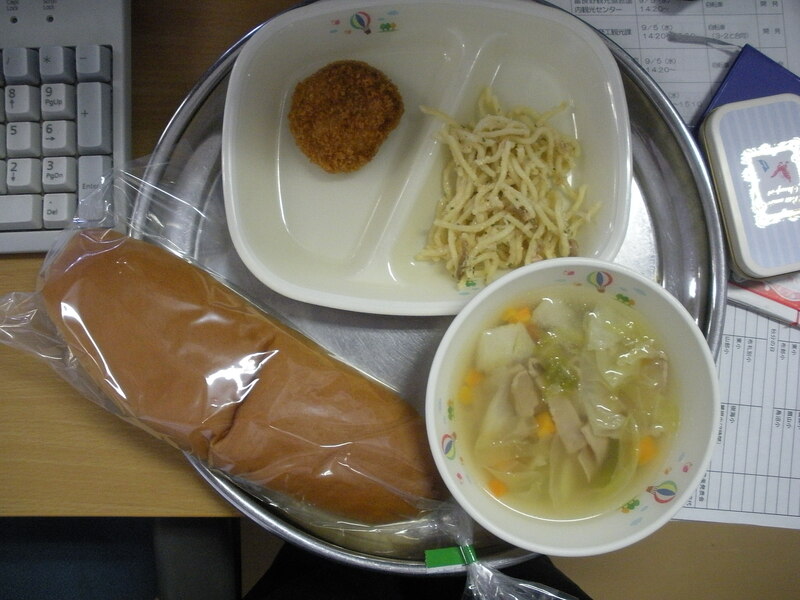 One of the girls in my class today ate it by tearing the bread into small chunks and put them all into the soup. She then fished them out with her chopsticks and ate them somewhat like dumplings. It doesn’t seem like a bad method. The salmon scraps patty had that unidentifiable fish taste that I much favoured in fish-sticks as a child, so I liked it. Of course, it was pretty oily, like most katsu. By the way, this anime is about Japanese patriots fighting against the moral corruption that the evil foreign aliens have brought to Japan along with modernization. Can you see the parallels to history?